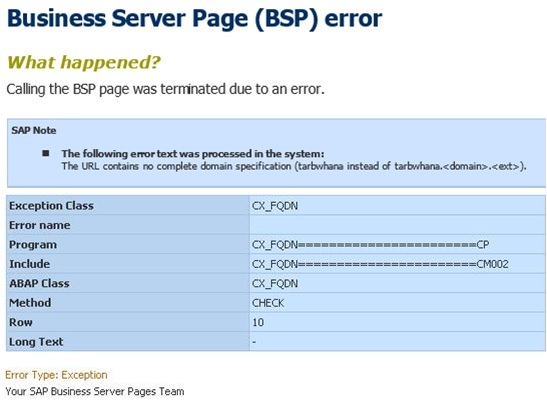 While working on Solman7.2 configuration, I faced an error exception CX_FQDN with Business Server Page (BSP), as it was looking for fully qualified hostname URL. Tcodes like solman_setup or solman_workcenter were routing to URL with FQHN, but while using tcode sm_crm, it was going to URL without FQHN. Check for below parameters at SAP and OS level, if any of it has not set properly then maintain it. The ICM sets the FQHN using the following hierarchy. 1. The parameter SAPLOCALHOSTFULL in the SAP profile (recommended for high availability configurations) has the highest priority. If it is set in a profile file, the ICM uses this value as the FQHN. 2. If the parameter is not set, icm/host_name_full is analyzed. 3. If this parameter is not set either, the ICM uses the FQHN of the operating system. For this reason, check the settings of the hosts file at the operating system level. The parameter SAPLOCALHOST is not fully qualified and is not used by ICM for the services. SAP recommends that you set either SAPLOCALHOSTFULL (for HA configurations) or icm/host_name_full. 3. There should be one or more entries. HOST field needs to be adjusted using FQDN instead of containing only the hostname. After making changes, tcode sm_crm was routing to FQHN url as required. In the interim, you can also put a period between host name and semicolon in the url.